From any other filmmaker, Bay of All Saints would have been a completely different film. Someone who had not spent time among the residents of the notorious water slums in Bahia, Brazil might have set their stories to somber music to match the extreme poverty captured on film. 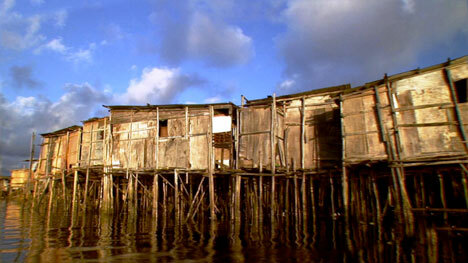 An outsider might have focused on the government's struggle of eradicating the palafitas—stilt houses built on the water—highlighting their hard work and exalting their attempts to stave off poverty and inadequate housing in the region. In the hands of anyone else, this story would not give weight to the have-nots. But after spending 13 years living and working in the palafitas and growing close with the residents, director Annie Eastman knew it was precisely these stories she had to tell. Eastman began her relationship with Brazil in 1999, working with a small arts organization, where she set about learning Portuguese and embarking on her first filmmaking experience with a director friend. She spent time traveling between Brazil and her home in the US, dabbling in filmmaking projects and humanitarian efforts from the homefront as well as on the frontlines. One of her main focuses is on women and family issues, which is precisely what drew her to the slums in the first place: the majority of the residents are single women and their children. 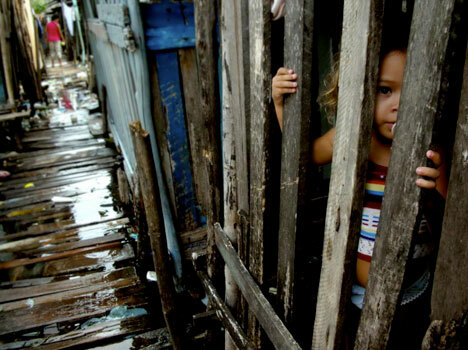 It wasn't until she heard about the Brazilian government's plan to displace the residents of the palafitas that she embarked on what would be a six-year stint living among and filming the people of the water slums. Eastman's choice to focus on this particular population may have strayed from investigative journalism; instead, her six-year project lead to a personal, inspiring portrait of the strong women and their families for whom "home" is a source of both pride and uncertainty. We spoke with Eastman after catching the world premiere of Bay of All Saints at South by Southwest in March, where it won the Audience Award for Best Documentary. She’s certainly excited to start more projects, but with the new momentum of this film, she’s learning that she can only do one thing at a time. IDA: Tell me a little bit about what first brought you to Brazil. Did you go out there with the intent of directing documentaries? Annie Eastman: I went originally to work as a volunteer in the same neighborhood where the film is shot, in the palafitas. This was about 13 years ago. I was just interested in learning the language and the culture. I was playing capoeta at the time, which is an Afro-Brazilian martial arts dance. I lived there for six months and then another year. While I was there, a good friend of mine who was dabbling in filmmaking came and said, "Why don't we make a film about the grassroots organization that you’re working with?" I ended up helping her out with that project, and that’s how I sort of got broken into the process of filmmaking, shooting and editing. A few years later, even though I'd moved back to the States, I did stay very involved with the community with fundraising for their grassroots organization and doing some grant-writing. When I heard the government's plan to displace the people who were living in the water, I thought, "That sounds like a good film. I should pick up a camera and follow that through." That’s how I originally got situated in this neighborhood. IDA: You started shooting this film back in 2004. I know that you had a good idea of wanting to document this displacement and the government intervention with the people living in the palafitas. Did you know what kind of story you wanted to tell when you went into the palafitas with your camera? AE: I didn’t know if this story was going to have a happy ending or a sad ending. I was just interested in seeing it through. As far as style of documentary, I didn't study documentary film, but I'd been starting to watch a lot of vérité films. I knew that was the approach I wanted to take. I knew I wanted it to be character-driven. I wanted to create an intimate feel that wouldn't necessarily be achieved by a film that actually studies and examines the urban development project itself, but rather a film that looks more closely at the way the people are living and what it feels like to live in a neighborhood like that on a day-to-day basis. IDA: How were you initiated into the community? How were you able to go into the palafitas with your camera? AE: It helped that I'd already lived there as a non-filmmaker. But in general, people there are very open to having a camera. I think they want people outside of their neighborhood to know that they exist, to see the way that they live. In fact, that’s very important to them. I really didn’t receive any resistance. Early on, I was certainly very concerned about crime. It's an extremely impoverished area, so a fair percentage of young men make their living as thieves. They operate together in a semi-organized fashion and go to other neighborhoods and rob people. I was very intimidated with the idea of having an expensive camera and bringing it into their area. The refrigerator repairman in the movie, [Norato], he's been a good friend of mine the entire time that I've lived in the neighborhood. He was the first person I talked to when I had the idea to make this film. I said, "Do you think it's even possible to have a camera back there, in terms of crime?" He said, "Yeah, I think we can do it." He went ahead and let everybody know that I was coming with a camera and that it wasn’t really something that they should concern themselves with--they should just let me go by. He was by my side every second of the production. IDA: I loved the fact that the story is never interrupted by your voice or by a direct camera address; instead, Norato becomes the character who guides the story. Was this a conscious choice? AE: It was a very conscious choice. It took that form very early on. You know, sure, I’m fluent in the language, I’ve even worked professionally as a translator. But there’s still no comparison between my language skills and his language skills, especially in terms of talking to the people in his own neighborhood. The dynamic he has with these women and everyone in the neighborhood, it’s so authentic. What was of more interest to me than anything was seeing the way he reacted to them. He's such a natural documentarian in a way. He's the type of person who's friends with everyone. He gets into everybody's business. He talks to the prostitutes, he talks to the drug traffickers, he talks to the extremely religious folks. He speaks to everyone in the neighborhood. There’s something very disarming about him. He loves to ridicule people but he does it in a disarming way. He may tell you that you don’t know how to dance or that your clothes are ugly, but you also feel that he would never humiliate you. He has such a talent for building rapport. That in and of itself was very interesting for me to document. IDA: Did you ever have to prompt him or ask him to seek further explanation on certain events from the women just so that things could be clarified, or did that sort of happen naturally? AE: I think he always intuitively had a sense of what I was interested in. Beyond shooting the film, we spent so much time together. I spent a lot of time with all the people in the film without my camera. I think he knew what was of interest. He had his own sense of what was interesting or what sort of things that he wanted to dig into with them. And then of course there was the actual narration track. We recorded hours and hours and hours and the narration track was culled from the many hours of narration that we recorded. There were a few things that he said in past tense that I later asked him to rerecord in present tense, or use a proper noun where at first he hadn’t. Those types of adjustments were part of our process. IDA: Because he has such an insider's perspective, it makes sense for him to be the narrator. Did you think from the beginning that he was going to be the voice of these women and this community? AE: I did indeed. He's actually one of the few people in the neighborhood who I feel can speak on authority with things such as the history of the neighborhood. There are a lot of people living there today who can't quite recount in the detail that he can—that originally, people were dumping trash underneath [to build land]. Since he's now in his early 50s and he was born and raised there, there's a way that he can speak about the neighborhood that very few other people can. Because of his dynamic with everyone in the neighborhood and because of his experience, and also just because of his own voice. I'm really drawn into the way he talks and his approach to storytelling. He just seemed like a natural fit to guide a documentary. IDA: Everyone who lives there has this great sense of pride about their neighborhood. Do you get the sense that a lot of their pride comes from this constant attack from people who are wealthy or seem to know better than them? AE: There is an "us vs. them" mentality to the haves and the have-nots. It shocks me how little the middle class in Salvador and throughout Brazil even knows about this community and other communities like it. This is said in the film, and it’s absolutely true: most people living in the city of Salvador, Bahia don't realize that there are large communities of people living in the bay. I think they thought that these communities existed at one time, and years ago there was a project to remove them and now it's over with. I just got back from Brazil, where I was screening the film in Rio and São Paolo, and there were some people from Salvador there. They were absolutely shocked to realize that this situation still was going on. About where their pride comes from, I can't really speak on that. There's such a strong sense of pride. In the last few decades there's been a movement toward Afro-Brazilian pride which is fairly incipient. The Afro-Brazilian people, especially in Bahia, they've accomplished so much, especially in the arts. A lot of times those things are duplicated and mimicked and they don't necessarily get the credit that they deserve. But that's sort of out of scope of the film. IDA: What has the general reception been? Have you noticed a distinct difference in Brazil versus maybe audience reaction in Austin at SXSW? AE: The people in Brazil feel very indignant when they see this film. It inspires dialogue around not just about this particular situation but so many others like it. I was just hearing story after story about different communities in Rio or São Paolo where I was screening that basically tell a similar tale. I'm really hoping there's enough fire right now and enough impotence to really get Brazil to address some of these questions, and hopefully the film will play a part in that. IDA: What is the life of the film off of the screen? AE: We're really in the beginning stages of structuring that. We want to structure it in a more detailed way, to engage donors who are inspired to help the people in the film specifically, and also donors who might be more inspired to help at a larger level. 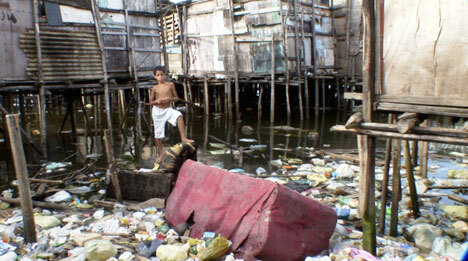 There are NGOs worldwide who deal with slum dwellers like Slum Dwellers International and Cities Alliance. So right now we're working on articulating an outreach plan to work together with some of these organizations to find out specifically the best way people can help. The thing I've been telling audiences is to please join our Facebook Page and get in touch with us with your own ideas about festivals we should screen at or about NGOs that we should be talking to to host screenings. That really is half the battle and it will help us in the next few weeks as we crystallize our vision for how to move this forward. IDA: Where are all these characters now? Do you find a way of keeping in touch with them, and do they know that they film has been so well received? AE: They came to the screenings in Rio, which was something I had dreamt about for years—the idea of bringing them to "the big city" outside of Salvador and having them to answer questions at the end and talk to the audience. We were able to do that in part because of the money we raised on Kickstarter. It was truly one of the best weeks of all of our lives. It was their first time not only on an airplane, but also talking to a broader audience about the situation they’d been living in. It was very rewarding. Everyone but Jesus and Rafaela was able to come. The kids were great at being a part of it. [Rebeca and Roger] are both of them at the right age to just get a lot out of it. Rebeca spoke and helped answer questions. It was a really exciting moment. IDA: So, what’s next for you? Any other projects you have coming up? AE: I have a dozen ideas that I'd love to move forward. Some of them I'm a little more closer to doing and some are just scribbled on a cocktail napkin. But for the time being, I'm still working long hours on this film. There's still so much to do, especially now that we’ve gotten some momentum. We're at the precise moment to make a big push forward with this. Hopefully I'll be able to make another film, if I'm lucky. It's such a privileged experience. I'm a person who tends to get so involved in the work I do. I'd love to take everything I learned on this project and apply it to something else. Katharine Relth is Web and Social Media Producer at IDA.